Inspection of property in question to find the bats or bat colony. Chimney? Attic? Inside the exterior siding? Many times the bats are in motre than one area. Identify the species of bats. Bats are protected by federal law and can only be excluded or removed before the young are born, or after the young can fly. Bats are highly protected during the maternal periods for their young. Seal up the exterior of the structure (home) except for the main enterances. Seal up any possible new entry points. Put up exclusion cones or bat netting. DO NOT TRAP BATS! Exclusion cones or bat netting is mounted on the main enterances to allow the bats to exit but not to return. 5. When all bats are gone, clean all the biohazard waste (guano) from the roost. Sanitize the roost area. 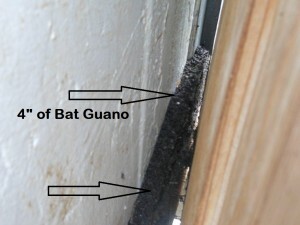 If the guano has saturated into sheet rock or siding you might consider just replacing it. There are 148 species of bats in North America. The ten most common are the Little Brown Bat, Big Brown Bat, Eastern Pipistrelle, Yuma Myotis, Eastern Long Eared Bat, Southeastern Bat, Cave Myotis,Evening Bats, Pallid Bats, and the Mexican Free-Tail Bats. Maternal periods for most bat species are from late May to late August. 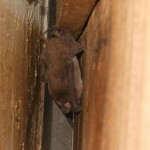 The Evening Bat is one othe exceptions with its maternal period from April to mid-July. 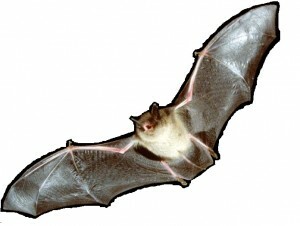 Bats are the most common carrier of rabies transmitted to humans. If you find a bat do not try to pick it up. Bats do bite when felt threatened. Frequently bats will land on people when the sleep and bite them. Usually the person bitten doesn’t even know it until they either find the bat in their bedroom or see the tiny bite marks. Wildlife removal of bats should be carefully executed for a proper handling of the bat colony. Know how to properly do a wildlife removal and performing a successful wildlife removal is key in not harming the bats and their young.